I was driving home from a friend's house, where we had gone for a party. Since it is an hour drive, and there was alcohol flowing, we simply stayed overnight. 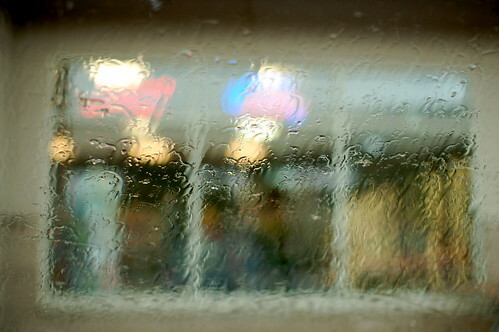 We awoke to rain, and reflected for a moment that were were glad to be in the car rather than on the motorcycles. Outside temperature was 58 degrees (F). As we drove it really began to rain hard. Of course we needed to stop. What on earth would make me get out of the car in a deluge?! Follow the link to read the rest! 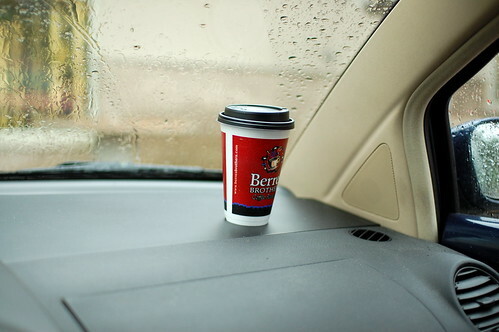 Well, a hot coffee for the road, of course! So fortified, we continued on our way. Only a couple of miles later, I stopped in the middle of the road, threw it in reverse, and pulled over to the side. I jumped out of the car - it was not raining so hard at this moment - to snap a few pictures of this grave marker. 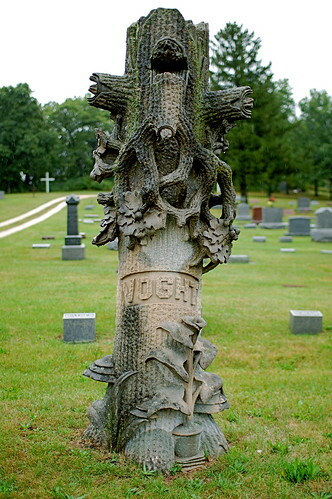 "Woodmen of the World: They were a fraternal benefit society founded in 1890, and members received grave markers from about 1900-1920. Because not all commissioned stonecutters followed the initial patterns, there is a great variety of art on similar themes wherever Woodmen are buried. I first came across them in the Knoxville Old Gray Cemetery. 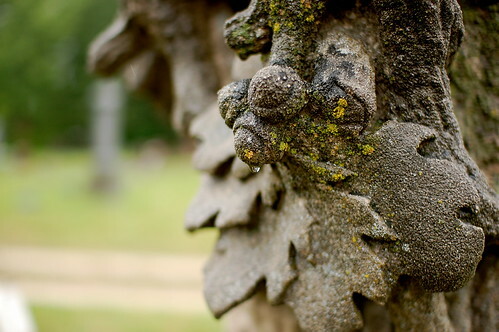 There's a Flickr group devoted to their headstones. " Well, so it seems I got to have a good time at a party, spot an interesting thing to take photos of, and learn something new, all in a twenty-four hour period. You have to love a weekend like that! Hello - Just wanted to let you know that Woodmen of the World is alive and well! We are indeed a fraternal benefit society and we were founded in 1890. Today, we provide insurance protection and financial security, as well as valued member benefits, for about 800,000 members nationwide. We no longer provide tombstones to members' families, but we do provide grave markers. You can find out more about us at www.woodmen.org. Great photo!